As children growing up in a race and class assembled society, what they see on television molds and prepares their mind for a world waiting to position them into a certain sector of life. By the time they reach the real world as adults, they have already been prepared by animated images and story plots to mentally accept this position. Because American society is so race and class conscious, Black children absorb a double dose of social positioning because mostly all television programs and movies for children are created and communicated from a white perspective. Many favorite cartoons and movies watched by Black children feature white characters and heroes. Any Black person who watched children's television programs in the 70's and 80's could definitely prove what effect these images have on the Black mind. Most can testify to the fact that they can see no other image of Superman, Spiderman, or Batman as being anything but white boys. This also applies to Santa Claus, the Tooth Fairy, Mickey Mouse and the entire Disney crew, and even Jesus Christ. Modern Psychology can prove that these images have lasting effects and cannot be easily replaced. Though many creative Blacks have attempted to portray either or all of these characters as being Black, it has never caught on in mainstream entertainment and probably never will. The images are etched in the Black mind and when attempting to visualize them as being Black, the image is always reintroduced into the mind from everyday propaganda. Thus, Black children absorb twice the amount of imagery to the destruction of their identity as white children do. Not to exclude white children, or any children from animated social positioning, the entertainment industry feeds the minds of these children not only with racial stereotypes, but is more and more incorporating the neutrality of gender. Many cartoons today have characters where their gender is difficult to determine so to portray a type of unisex concept. In addition, if a parent were to attentively listen to the words of some of these cartoons, they would discover that the phrases and messages being sent to children are designed to create a neutral and unisex vocabulary in children. There are attempts to diversify children's programming by producing a Black cartoon or character voice and behavior in some movies, but the attempt only deepens the impact of racial stereotypes. Children mentally accept these stereotypes and turn and view other people as mere characters and not individual humans. Furthermore, because most shows are populated with white characters and lifestyles, white children automatically see themselves as the social standard while every other minority is merely an add-in or sub-character. Commercials, toys, video games, and other marketable images to children center on the white character and any attempt at diversity by using a Black or other minority image are stereotyped into a social position. With subconscious programming like this, America will remain a white dominated culture with minorities as simply sub-cultures trying to live up to standards and behaviors very different from their own. Not to mention the changing culture of gender roles and sexuality. Mainstreamist claim that one culture possesses talents and characteristics unlike other cultures and those traits should be emphasized as positive traits, however, who's to say that those traits are not the result of stereotypes? If Blacks are considered the best dancers and singers, i.e., entertainers, it is because this is the position we have been slotted into in society. Whites are slotted more heroic and intellectual positions through cartoons and other television programming thus they expect this given role in society. If the roles were reversed, society would be different. Whites know that the images implanted into the minds of children will formulate into opinions and beliefs throughout life so they attribute themselves as the best and or most qualified for the most prominent roles in life. Whereas they also know that if they continue to position Blacks and other minorities into roles that does not present leadership or intellectual abilities, they can continue to fashion sub-cultures as subservient to their own. 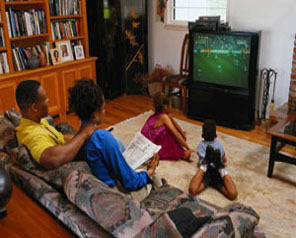 Black parents must begin removing these images from their children's minds by explaining to them that television does not necessarily mimic real life because if they do not, children will believe it does and accept a subservient position to whites. It may be difficult to do this since the propaganda is all around us, neither can this feat be considered racist teaching. It is an effort to educate your child to what is real and to who they are and what they are capable of doing. Blacks who attack this problem from the back end are creative and intelligent enough to know that to change such indoctrination of a nation, you have to work from the inside. So many Blacks have tried to attain careers in television programming as cartoon artist and program production but they only reach another reality of life there to block them, which is employment discrimination. The effort, however, is not in vain. At some point Blacks and other minorities will be able to program America society the way it should be programmed; to meet the needs and ideas of a culturally diverse society where people are people and not characters.